There are a lot of bookshelf speakers that seem to have been on the market forever, while getting much less attention that they probably deserve. One of those is the Wharfedale Diamond 10.2 bookshelf speaker. This speaker is a durable, high-end one, and that’s just the tip of the iceberg. We cannot even start our Wharfedale Diamond 10.2 review without mentioning its extension, the rich midrange, and the increased bottom end. This is one of those bookshelf speakers that make your home theater or listening environment feel like a professional studio. If you value good audio during movie time or when you are listening to music, the Diamond 10.2 is definitely an option to consider. It’s also small in size, so great for compact shelves. Keep on reading and learn how you can benefit from owning this masterpiece. 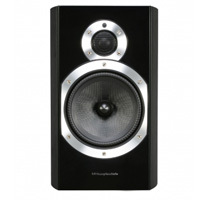 The Wharfedale Diamond 10.2 delivers the high quality sound it promises. The best thing about this speaker are its rich midrange levels – they will sweep you off your feet. The Diamond brings along a bunch great features, such as its strong construction and great connectivity options. At this price, there’s not much not to like. The Wharfedale Diamond 10.2 has a big metal circle on the front panel. Although the circle is there to ensure high quality sound, it could be less shiny, as it might come as a bit of a turn off. If you’re too picky about your home decor keep the grill on. The Diamond 10.2 is one of those speakers that can bring a lot to the table, which still being affordable. This bookshelf speaker can simply level-up your home-theater game. 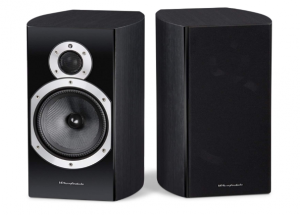 It is one of the best models Wharfedale has ever offered, and for all the right reasons. Compared to its predecessor, this speaker has a larger cabinet and driver, among other things. So, although a little bit larger than you would expect it to be, this speaker provides an unimaginable performance. Design-wise, it’s very nice and sleek, while still keeping that luxurious and modern feel. You shouldn’t have trouble getting it to fit perfectly into any interior – if you’re not a fan of the shiny steel, just keep the cover on. The 10.2 also comes in various colors, which means that you can pick the one that matches your own style, like the Rosewood below. The whole construction is very strong and damage resistant. So, once you invest in this amazing bookshelf speaker, you know that it will likely stay intact for years to come. The surface finish is also damage-resistant, so you can move it around easily without worrying that you’ll do something to it. The Wharfedale Diamond 10.2 bookshelf speakers can offer very low-end authority, nice mid-range liquidity and that high-end smoothness we all enjoy. With a very rich mid-range, the Wharfedale 10.2 is amazing because it offers real instrumental accuracy. It can provide the sounds that only the pickiest of audiophiles can recognize. We also shouldn’t forget to mention the power that the large woofer can offer. In addition to this, the Diamond features strong cabinet walls which improve the overall performance of this speaker. The secret behind the incredible performance of this bookshelf speaker lies within the custom-made soft-dome tweeter. The tweeter ensures a clear sound at the highest frequencies of up to 30kHz. Moreover, the 6.5-inch woofer and twin rear-firing ports bring up the bottom end and produce a beautiful punch. Other improvements range from a low-profile case to robust cabinet walls. Those, along with a composite front-baffle panel, all add to the decreased vibration, hushed distortion, and enhanced rigidity. For the end of our Wharfedale Diamond 10.2 review, we would like to add that this neat-looking bookshelf speaker comes with some of the best specs you can get for the price. It may not be the cheapest bookshelf speaker out there, but it certainly isn’t very pricey. Compared to other similarly-priced units, this one can ensure that you get impeccable British sound and great connectivity, all while making your home-theater experience a lot more enjoyable. 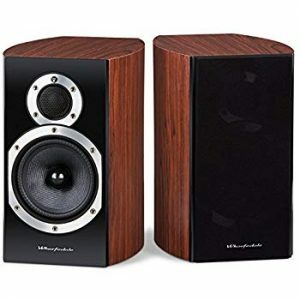 Why not check out the Wharfedale Diamond 10.2 on Amazon and see the reviews from other buyers?